Today I want to talk to you about skincare, specifically my current night routine. I changed it up a bit to try some new items/steps that I haven’t done before or haven’t been doing regularly. This is actually where I’m rotating several things to try them out, but Bifesta has been my mainstay for some time. I am about to try out the Bifesta Cleansing Lotion Agecare variant because I want to focus on anti-aging. 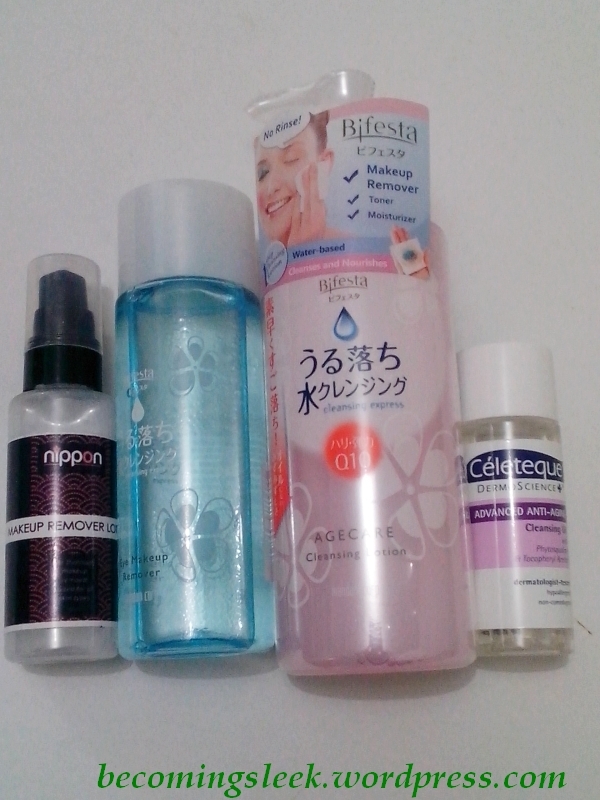 The other items I’m trying are Nippon Makeup Remover Lotion, Celeteque Advanced Anti-Aging Cleansing Oil, and Bifesta Eye Makeup Remover. I’m pretty excited about that last one since I’ve been waiting forever for a good (yet affordable) bi-phase remover for those stubborn waterproof eye makeup. 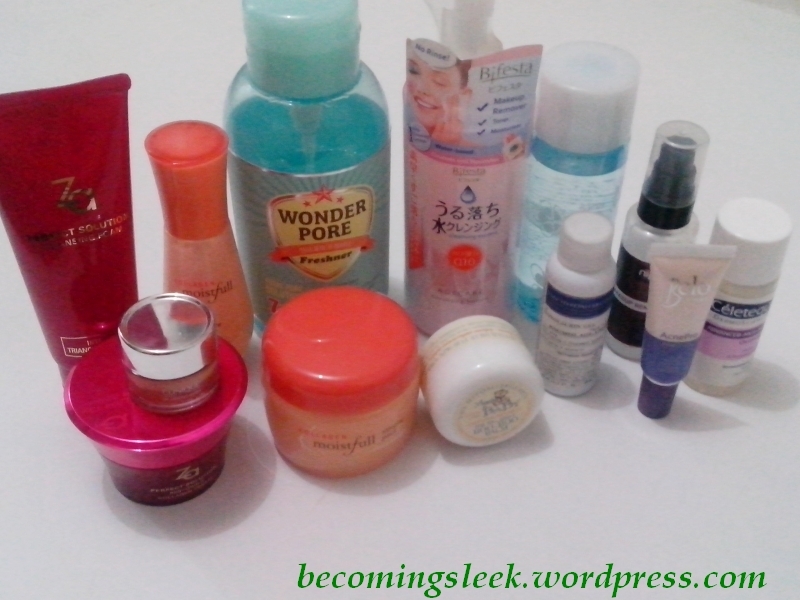 My new cleanser is ZA Perfect Solution Cleansing Foam (from The Beauty Junkee giveaway loot). It’s my first time using a cleansing foam and I’m having so much fun with it! I love lather and it only requires the tiniest of the product to make enough lather for my whole face. I feel really clean and actually moisturized after washing my face with this. This is the only one that I haven’t changed. 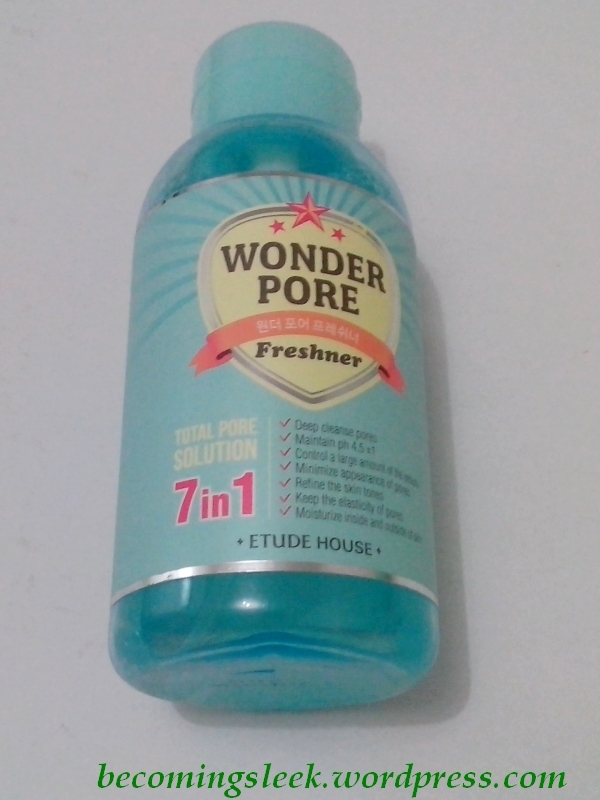 I’ve been using Etude House Wonder Pore Freshner for quite some time and it’s still my favorite toner by far. I don’t really use it every night, only on nights when I’m feeling extra clogged. I bought this big bottle way back last year (!!) and I’m not really even halfway through it! This is the new step I’ve introduced to my routine. I’ve decided to really focus on a consistent and complete night routine so I’ve added the essence/serum step (from the Korean and Japanese multistep skincare routines). I chose Etude House Moistfull Collagen Essence because collagen is something I associate with anti-aging. I’m so far liking it, and the packaging feels pretty luxe with that glass bottle. I plan to write a full review of this once I’ve used it for a few months. This is where I’m the most inconsistent. I only put on eye cream when I happen to remember it! 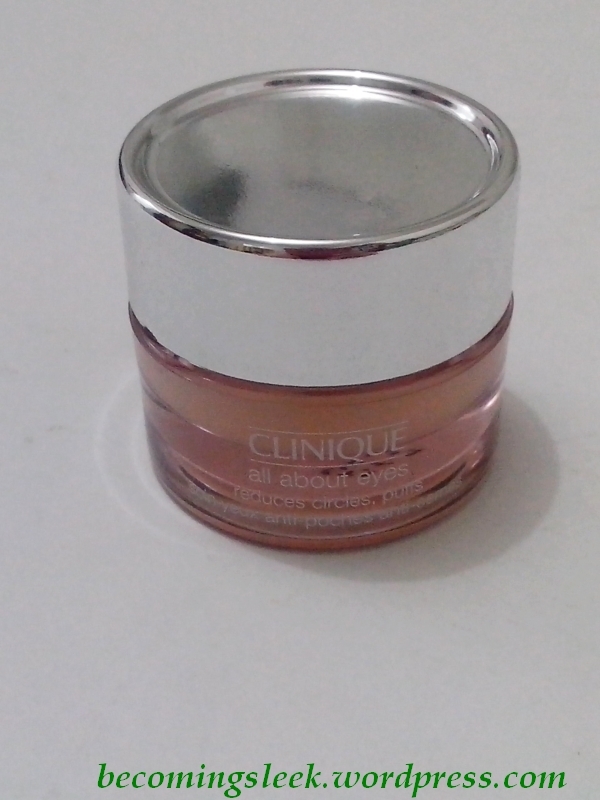 Right now my eye cream on rotation is a sample tub of Clinique All About Eyes. It’s not particularly remarkable, and I guess I’m still on the hunt for a good eye cream that I’ll feel connected to. The cream I have started trying is the partner of my cleanser. 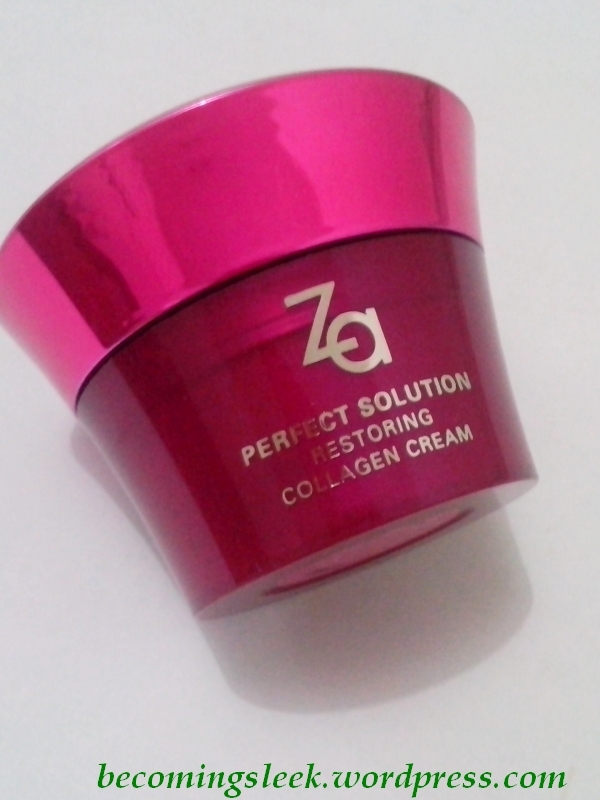 It’s ZA Perfect Solution Restoring Collagen Cream (also from TBJ gift pack). 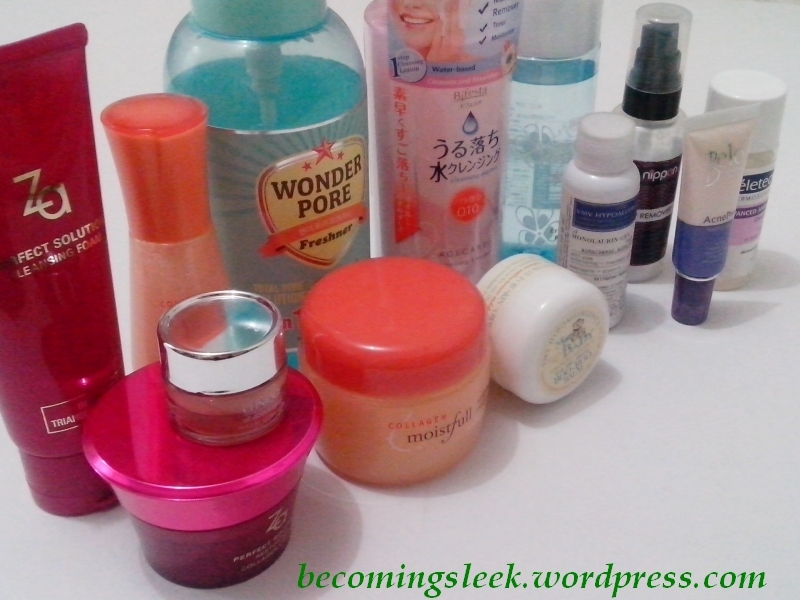 I love how it ties in with the Etude House collagen line. The bright metallic pink cap is also quite unique. The cream itself is pretty thick and heavy, which makes me be thankful that it comes at the end (usually) of my routine. It basically seals in everything I just piled on. It can be a bit stifling in hot weather but at least recently it’s been getting colder. I’ve tried one other sleeping pack (Laneige) and loved it, which is why I decided to get the essence’s partner in the same line. Etude House Moistfull Collagen Sleeping Pack is just that: the sleeping pack part of the routine. It’s pretty gel-like in consistency, and doesn’t really feel bad atop the cream as it’s almost weightless. It’s also not meant to be used nightly; maybe twice a week at most. The main difference between this and the Laneige Sleeping Pack is that the EH one needs to be rinsed off the following morning. I haven’t even used any in the tub yet as I’m using up the product stuck on the lid! This is going to last me a loooong time! These are just for specific items that I use for specific issues (which isn’t nightly, thank goodness!). 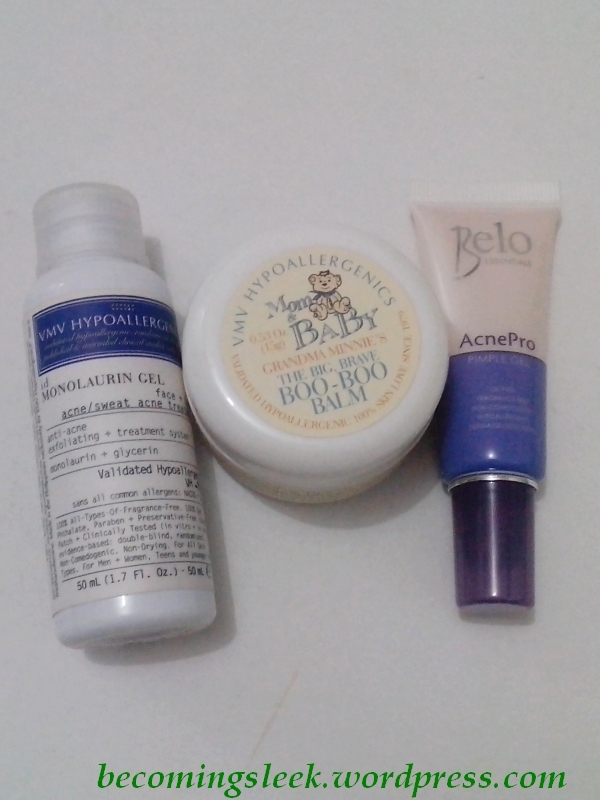 Belo AcnePro Pimple Gel for the occasional flare ups; VMV Id Monolaurin Gel for the more serious acne; and VMV Grandma Minnie’s Booboo Balm for, well, booboos! These are used only on an as-needed basis. There we have it! It may seem like a pretty tedious process, and it is, but I want to really dedicate some time in my evenings for skin care. I’m already in my 30s and it’s about time I start on a serious anti-aging regimen. Did you try any of these products? I would love to hear your thoughts! BTW VMV does not address cystic acne ha. Just thought I’d put it out there since you mentioned you reserve it for the more serious acne. Re: VMV onga true. I don’t get cystic acne naman, but I’ll put a note in the post. Thanks for notifying me about it! Re: sheet masks: onga! I am not very masipag in the case of masks. At which part of the routine does it go into? What is your top anti-aging recommendation for sheet masks?